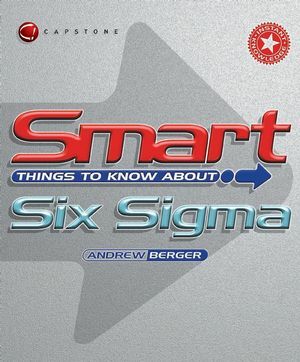 Smart Things to Know About Six Sigma lets managers and executives bridge the gap between the theory and the practical application of Six Sigma. With its track record as an effective way to cut down production defects and costs, Six Sigma has become hugely popular since Jack Welch used it to famous effect during his time at General Electric. This book offers an integrated approach to Six Sigma that combines best practice examples with a practical mechanism for implementation. It is also unique in showing how companies can close the performance gap between what they can do and what they actually achieve. The book also examines the top twenty Six Sigma Analyses and explains their use. ANDREW BERGER is CEO of Continuous Innovation Culture Ltd, London UK - a Six Sigma software company. He has helped major corporations to deliver significant improvements in performance and to increase their delivery of financial benefits. He has worked with a range of multinational companies including BP, BOC, Powergen, Sony, BAT, UK government and Shell. He has worked on improvement programmes in 13 industries in over 24 countries. Andrew was co-author of Supply Chain Cybermastery (Gower) and has also contributed a number of articles and chapters to recently published books. Assessing the Pontential Benefits of Six Sigma. The DMAIC Define Phase and Charter. DMAIC - The Measure and Analyse Phases. The DMAIC Process - Improve. The DMAIC Process - Control. Successfully Managing Six Sigma Change to Deliver Financial Benefits. Introducing Design for Six Sigma (DFSS).